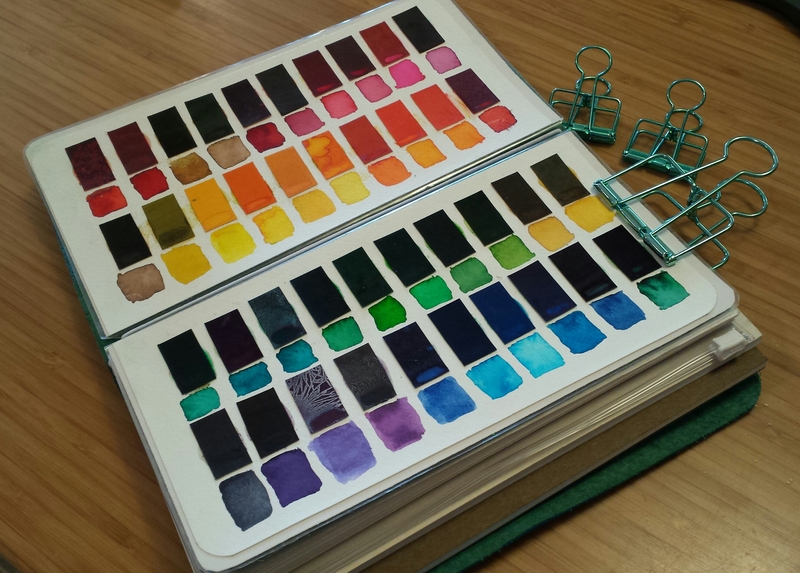 Not too long ago a friend gifted me with a sampler set of six Peerless Watercolors. What are they? Forget about tube or pan watercolor paints – Peerless Watercolors are these awesome PAPER-BASED paints that when activated with water perform like any other watercolors. Peerless Watercolors are available online from Amazon and other retailers. I was lucky enough to find them in person this weekend when I was visiting a local store, Two Hands Paperie in Boulder Colorado. 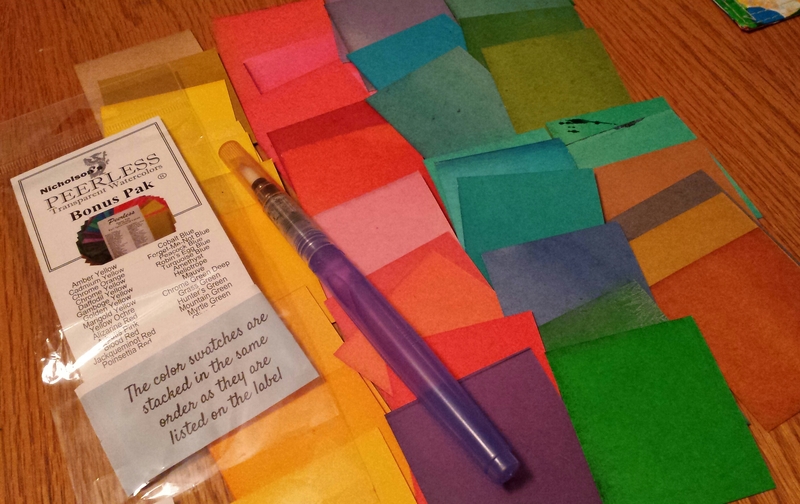 I found the Peerless Watercolor Papers Bonus Pack (Small), a set of 40 different 2×2″ square watercolor papers. The bonus pack was arranged in order, as was described on the packaging – important because the individual color swatches aren’t labeled. Once I got it home, I was so excited to show them off and test them I got them all mixed up, and couldn’t put them in that same order again. They’re really fun, vivid bright watercolors. And so travel-friendly and portable! 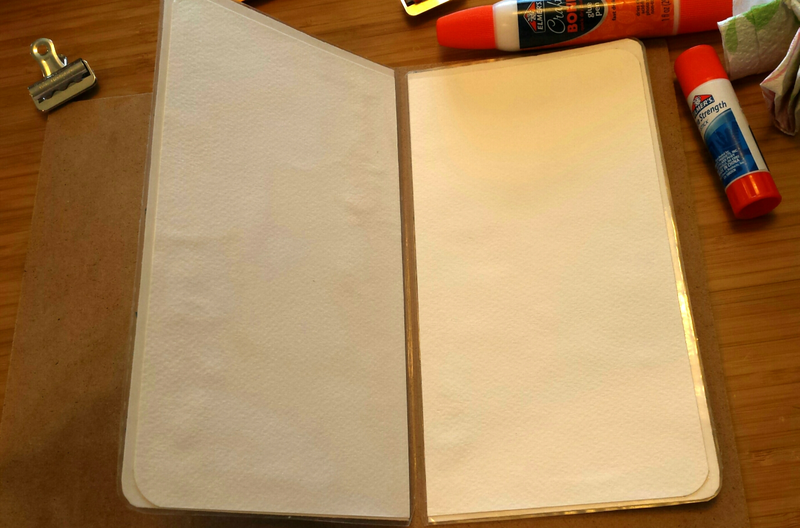 So I have this laminated “dashboard” for my fauxdori / midori traveler’s notebook planner. I bought it from ToDie4Planning on Etsy. Dashboards are used to hold sticky notes, washi tape, images, basically a more solid surface for whatever you want to use them for. 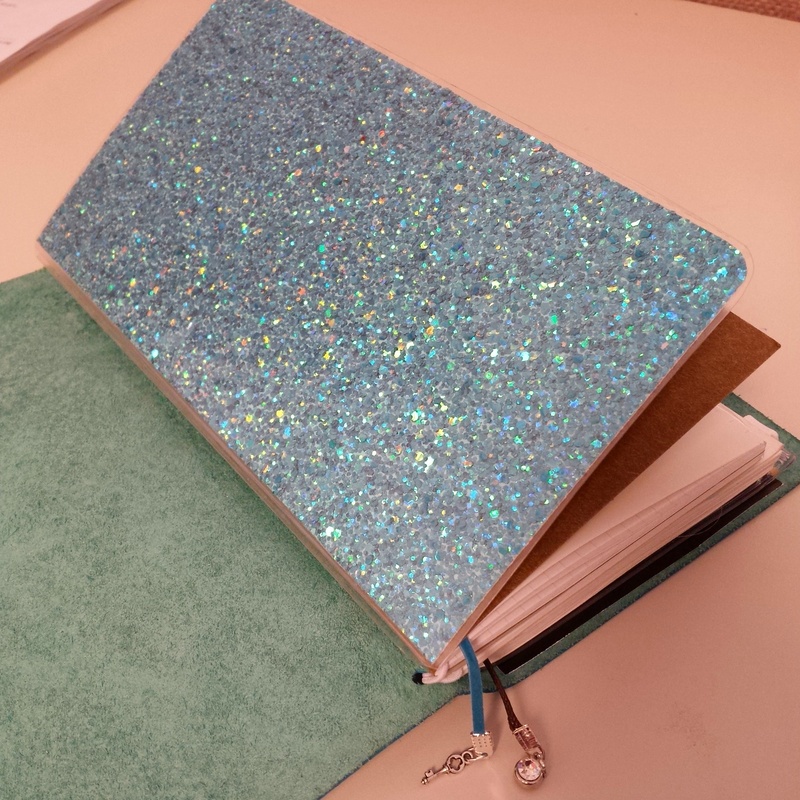 I picked this one because it’s a glittery seafoam green color called “mermaid” on the outside (just plain white on the inside) – a perfect match for my planner cover. Problem is, I really didn’t use it. Like, at all. It was basically pretty but pointless, sitting there in my planner. 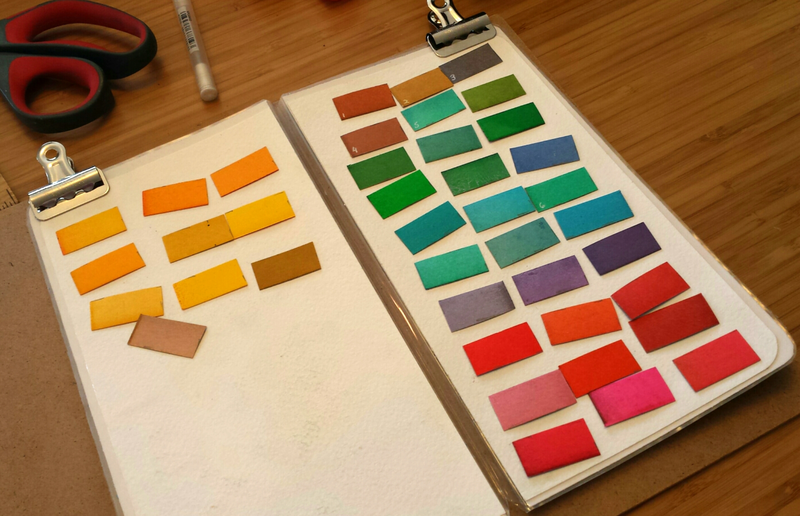 So I was posting pics of my new Peerless Watercolors this weekend to Instagram, and in looking at the hashtag noticed a couple of people had cut up the sheets into little pieces and made traveling palettes for their planners. And I thought, AHA!! That’s a perfect use for this dashboard – it’s a sturdy plastic base for these paints. I assembled some supplies. The watercolors, the dashboard, a composite wooden board I use to clip drawing paper to, a waterbrush, glue, scissors. First, I cut a sheet of watercolor paper into two pieces the same size as each half of the dashboard. This was to be my surface, because not only did I want to glue the Peerless pieces to them, I also wanted to dab a swatch of paint next to each one. And the laminated surface of the dashboard as is wouldn’t work for that at all. I rounded the corners of the outside edges, and glued them to the inside of the dashboard. It’s a little lumpy looking now, but that won’t be noticeable by the time I’m done. 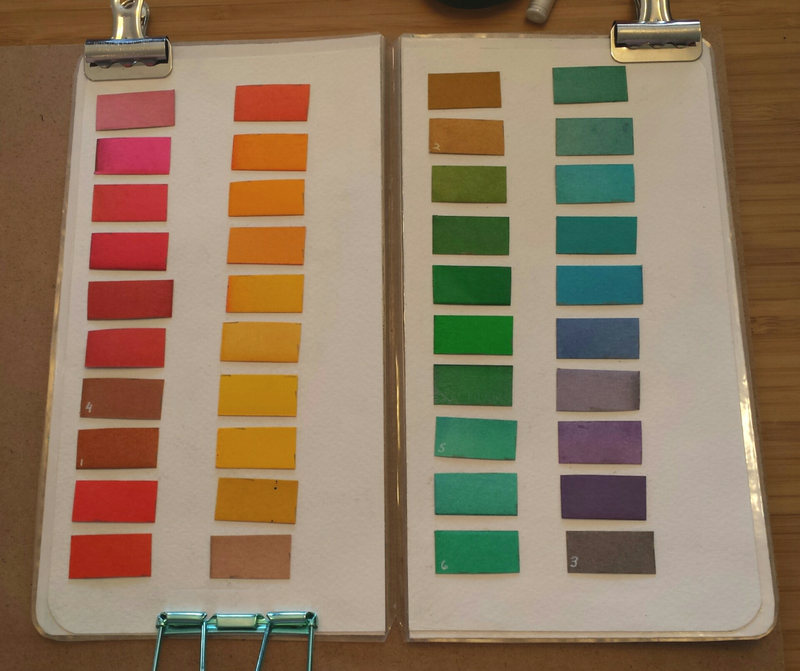 So then I had to decide what size pieces of watercolor to arrange in my palette. I had 40 colors total in the Bonus Pack, so knew I needed 20 per side, and needed a decent spot next to each to dab the actual color with the waterbrush. 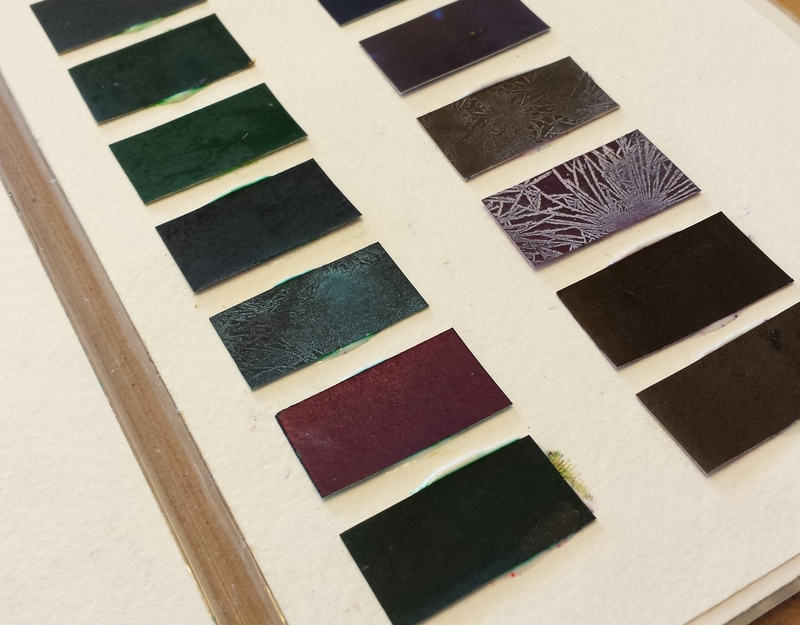 I cut a 1/2″ strip off each square, and then cut that into a 1″ piece – so each piece ended up being 1/2″ x 1″. I was going to start numbering each mini piece to the larger square, hence the white numbers in this pic, but then figured eh, screw it. They were already hopelessly mixed up anyways! Arranging the colors. The thought was two columns of 10 colors per side. Problem was, all the handling of these pieces gets your fingers mega messy! 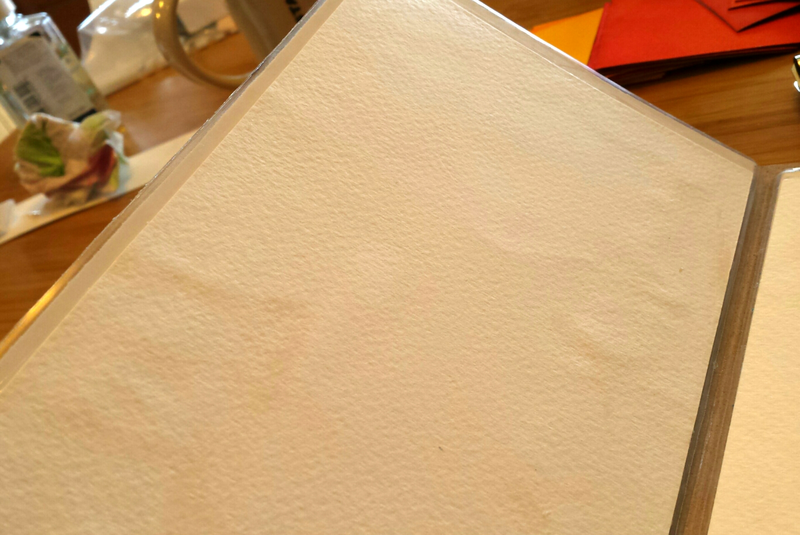 And then the white watercolor paper I was going to glue to started to get all messy too. I had to move all the pieces off of my base and get them in the order I wanted and erase all the marks they left on my paper. So then I started gluing one by one, struggling to remember to glue the pretty painted side down, so that the actual transparent watercolor side was available for me to use. Problem is, the glue kinda seeped out over the edges of each piece as I glued it – and I soon learned that if I wiped it off, it either got glue all over the top, which I didn’t want, or would get color over the white spaces. Take a look at these close-ups. 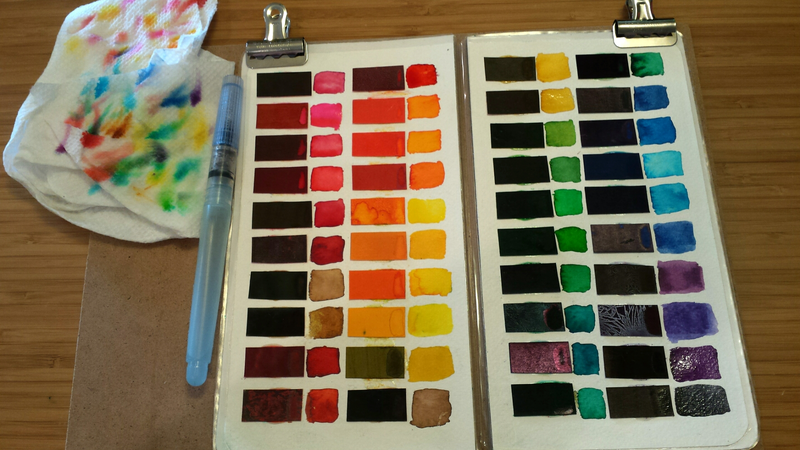 The next step was to take my waterbrush and make a sample of each color next to each Peerless Watercolor piece. I’m going to take some onion skin/Tomoe River Paper and cut a piece to fit over the watercolor pieces so they don’t rub against each other. Hopefully the glue sticks!! So far they haven’t popped off yet. 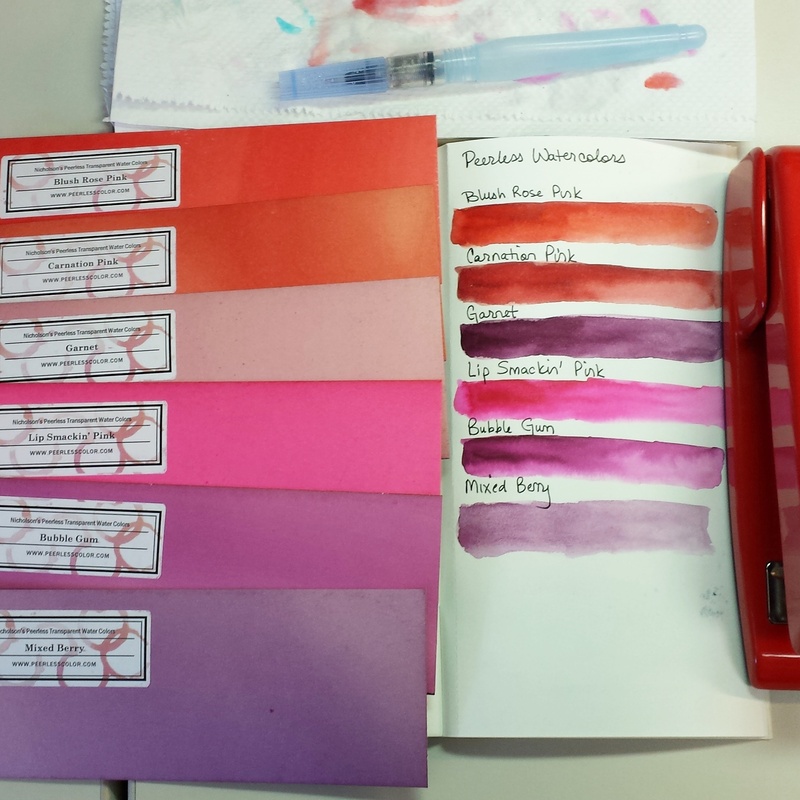 I slid the old dashboard / new watercolor palette through an elastic in my fauxdori cover – my plan is to leave it as a standalone insert in the planner, and not piggyback it around any other refill – I want to see both sides of the paints in one glance. Here it is in my planner. 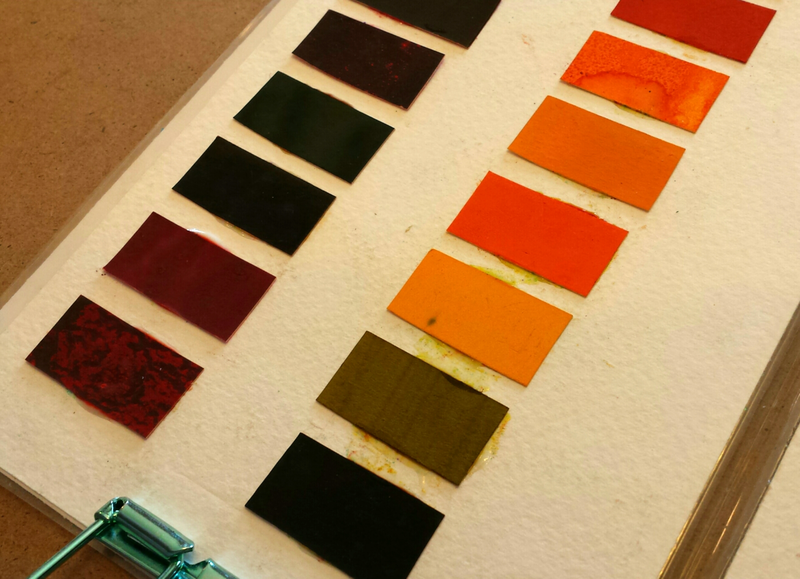 I had extra pieces of Peerless Watercolors left over, 1/2″ x 1″ because of those strips from each square cut in half. 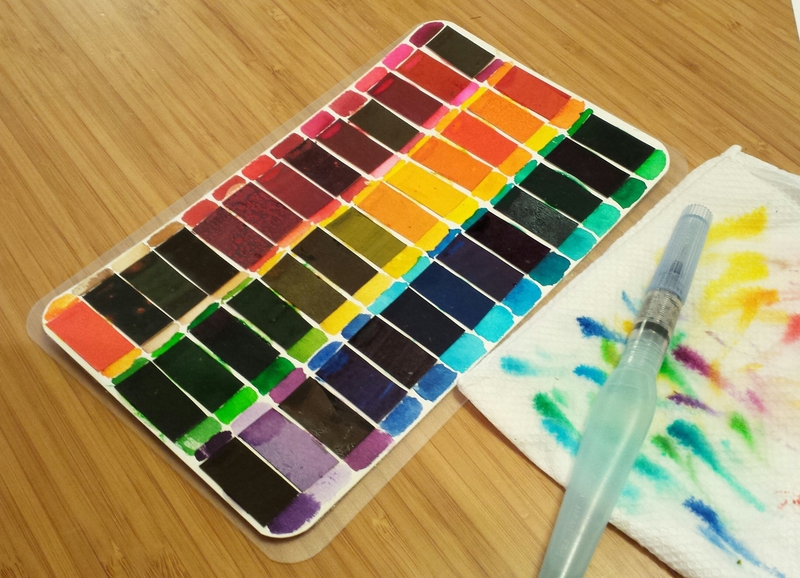 So I thought I’d make another portable palette to use with my various sketchbooks. But I didn’t have any extra laminated “dashboards” left over to use as my base. 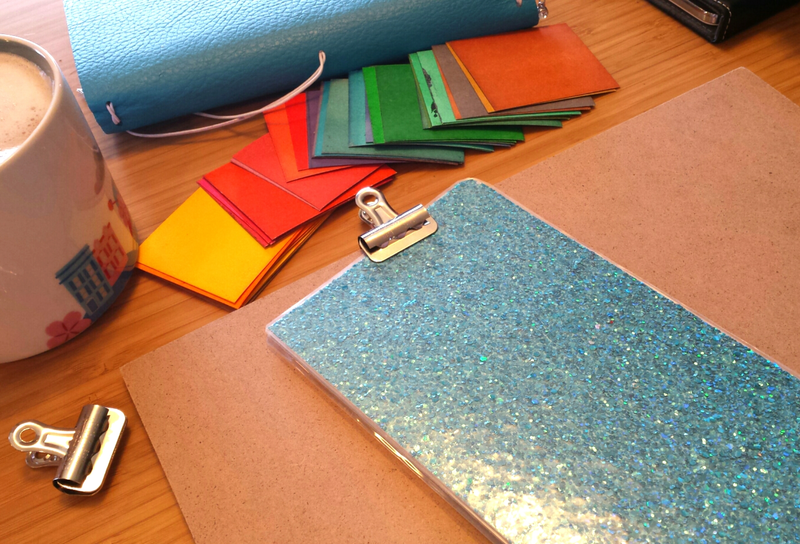 I did have some extra plastic cutting mats thought, the result of my plastic Circa planner cover experiments. Most of my sketchbooks are 8.5″ x 5.5″, so I cut a sheet into a 8.25″ x 5.25″ piece, rounded the edges, and cut a piece of watercolor paper to glue to it, following the same process as above. 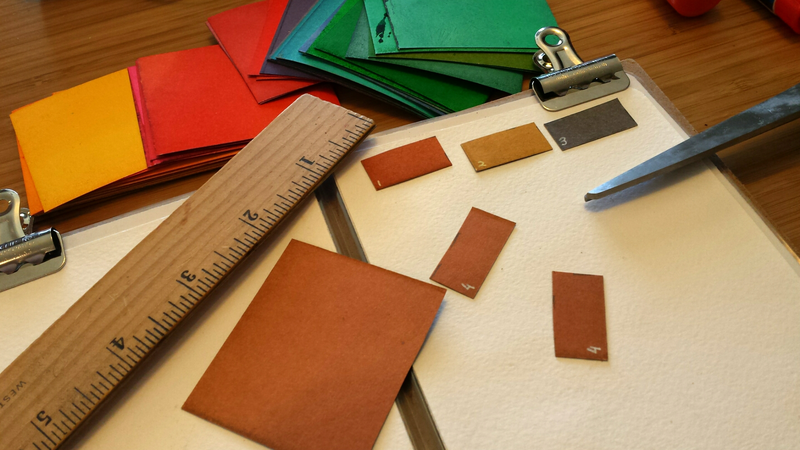 Then glued down the pieces and made swatches. 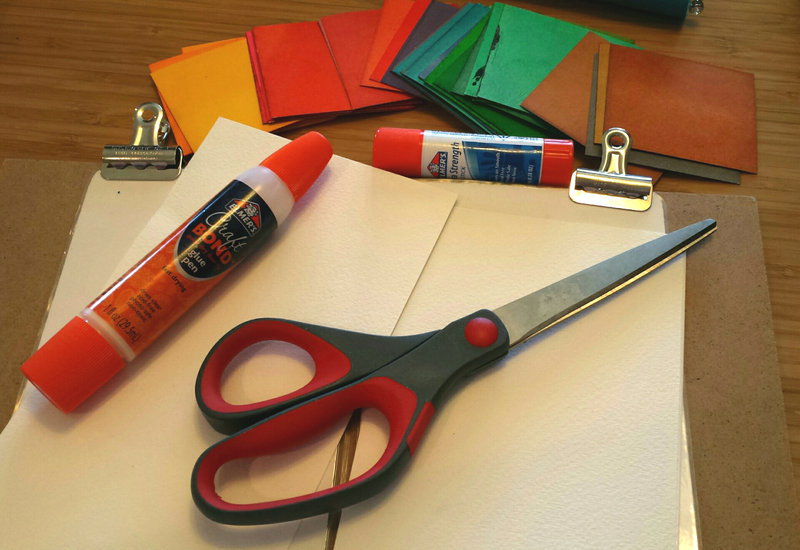 Problem is, the watercolor paper top wouldn’t stick to the plastic cutting board base no matter how much glue I used! It’s already popped off. I have glue dots holding it on for the time being, but don’t think those will last very long – that’s what experimenting is for though! I’ll just slide this sheet into my other sketchbooks when I’m not using the planner palette.